Quianna Holden is the kind of mother we all should have, if ever out of the darkness evil comes to strike us down. A little less than two years ago, on the way home from a late-night teen basketball program, Quianna’s son Trevon was struck and gravely injured by a hit-and-run driver while in a crosswalk on Martin Luther King Jr. Way. In the hospital, after he came out of an 80-day coma, she used an alphabet board to ask if he could remember the face of the driver who hit him, and summoned police when he said he could. When he finally came home from the hospital, seven months after he was hit but still only able to speak a few words and confined to a wheelchair, she moved into the dining room of the family’s South Seattle home, so that she could sleep on the same floor as him. And when, by her account a year after the accident, she found out the police had stopped actively looking for the driver who hit her son, despite having found the vehicle, she kindled a righteous anger. Trevon’s case is one of three hit-and-runs involving South Seattle residents where the investigations seem to have stalled. In all three, the cars were found soon after the crimes were committed, one with the owner still inside. In two, promises from the mayor’s office didn’t help – or were broken. And in all three, after a flurry of publicity, progress seemed to stop, and families described being left with little but questions. For the Holden family the change was abrupt, and came about when the detective on their case retired. After five months of what seemed like strong progress, including the identification of a possible suspect, Quianna said investigators stopped returning her calls to check on the case. For more than a year after that, she said, she called the department every week, sometimes multiple times, each time leaving a message asking for an update on her son’s case. Only twice, she said, was her call ever returned. After three months, she got a call saying the detective on her son’s case had retired, and the case might not have ever been forwarded to another detective, but that they would look into it and get back to her, she said. After a week went by Quianna knew it was time to start calling again. Four months later she got a second call back, she said, and was told the department hadn’t looked into the case any further. There were too many other cases, she was told, and they didn’t have time. And while the first detective on the case had told her he had a possible suspect, this time Quianna said she was told there were no suspects at all. In February, after a year of phone calls and only two calls back, Quianna filed an official complaint. The response was immediate, and a night-and-day difference from what she had received before. The same week, she got a call from a sergeant, who scheduled a meeting with her to follow up on the case. That meeting is now pending. But despite her obvious care, the new sergeant has largely repeated the same lines about the case, Quianna said, and the lack of progress has left a bitter taste in her mouth. Police spokesmen generally refused to comment on the case, citing its status as on open investigation, but said the case is currently assigned to a detective, who also has other cases. When asked for comment on the unreturned phone calls, Seattle Police spokesman Sergeant Sean Whitcomb refused to comment specifically, and would only say he stood by an earlier statement that “detectives have been in regular contact” with victims’ families in all three of the cases mentioned in this report. Seven months after a hit-and-run driver struck their daughter and kept going, Zeytuna Edo’s family is also still waiting for answers. The seven-year-old girl was struck in the crosswalk at MLK at Genesee, as she walked with her father and sister to the nearby Boys and Girls Club last September. Yet, despite what seemed like a strong start on the case, the family says they were soon told the investigation had all but stopped. After the accident things seemed to go well, or as well as they could. There were several witnesses, and the case generated a flurry of media coverage and so many calls to investigators that they thanked the public for “a flood of tips.” Within a week, one of those tips led police to the truck that hit Zeytuna. Two weeks later the little girl came out of her coma and surprised doctors by recovering her ability to speak soon after that. And a month after the accident, Mayor Ed Murray attended a vigil for the girl, and said he would look into the case. At a meeting after the vigil, South Seattle residents raised so many safety concerns and questions about why no arrest had been made that the mayor instructed one of his staffers to call police Chief Kathleen O’Toole, and get her to come in person. O’Toole couldn’t come on such short notice, but Murray said he would arrange a community meeting with her to address the concerns. Speaking with the family directly, the mayor also said he would inquire about the investigation and follow up with them. But just when it seemed as if forces would finally align to solve the crime, progress stopped. The community meeting with the police chief never happened. And, Zeytuna’s father Moalim Edo said in an interview earlier this month, no call from the mayor’s office came. Speaking through a translator at the family home last month, Edo said two weeks went by after the vigil before they called one of the mayor’s aides. A month after the vigil, Edo said, the family met the aide and police officials at the SPD South Precinct, and were told there was no new information on the case, and no progress to report. The meeting with police and the mayor’s aide, said Edo, was the last time the family heard from either the city or the police. “It’s like everyone has forgotten about her,” said Edo. After a request from the Emerald for comment this week, a spokesman from the mayor’s office contacted the Edo family and asked about the alleged missed follow-up. Viet Shelton, the mayor’s press secretary, said that in the call the family gave a different version of events. When a reporter from the Emerald called the Edos, family members would not confirm Shelton’s statement, and refused to talk further about the case. Deb Salls, director of BikeWorks, another organization that helped arrange the Edo vigil, voiced a similar sentiment. Shelton, the mayor’s press secretary, refused to make the mayor available for an interview with the Emerald, but admitted the community meeting with the police chief never happened. Because of the Emerald’s inquiry, Shelton said, the mayor’s office would set up the meeting. Shelton didn’t give a timeline for the meeting, but said it would happen as soon as possible. Leo Almanzor’s family reported feeling similarly left in the lurch after a staffer from the mayor’s office attended a vigil for Almanzor, who was killed by a driver fleeing police downtown last November. At a vigil two months after Almanzor was killed, the mayor’s aide told the family he would look into the case and follow up with them. But Almanzor’s sister Lisa Almanzor said she never heard from him. Like the Edo and the Holden families, the Almanzor family said they also had difficulties communicating with police. “From the beginning, things were left out,” said Cat Kalepo, Almanzor’s niece. The biggest thing that was left out: the police didn’t mention to the family that Leo had been killed by a fleeing suspect. Instead, the family found out from a reporter three months after Almanzor’s death. Ultimately, Kalepo said, the family had to hire a lawyer to get the police reports from the day Almanzor died. And while Almanzor’s case is less than six months old, his family is still frustrated at the process. The fleeing vehicle was found shortly after Almanzor was struck, with a person still inside, Kalepo said. But that person was ultimately let go, and the case remains open. Now, Kalepo said, the family gets an update from the police if they call and ask for one, but it always seems to be the same update – no new progress to report. Whitcomb, the police spokesman, refused to comment on the case, and contradicted the family’s claim that communications started out poorly. “We were in regular contact… right from the moment” the case was opened. “If their experience was different, we find that unfortunate,” he said. Shelton, the mayor’s press secretary, said the staffer who attended the vigil did in fact check with police on the status of the case, but never called the Almanzors afterward. Police representatives refused to comment on any of the three cases, citing their status as ongoing investigations, but were forthright about hit-and-runs being difficult cases to solve – a sentiment repeated by prosecutors tasked with handling the cases. “It is probably the most difficult whodunnit that exists,” said Amy Freedheim, the King County deputy prosecuting attorney who handles the most serious traffic cases in the county, including the worst hit-and-runs. By their nature, she said, hit-and runs leave little evidence. Seconds after the crime is committed, the weapon is far away, fading into a sea of other cars. Even if the car is found, she said, proving who was behind the wheel can be an even harder task. While a car being reported stolen after an accident might seem like a cover-up by the owner, she said, the truth can be difficult to pin down. If car was stolen at night, or while someone was at work, it could be used in a hit-and-run before the owner noticed it was gone. Showing that a person’s fingerprints were in his or her own car doesn’t usually prove much either, since they would be there anyway. And just because a car’s owner refuses to talk to police, it still isn’t usually reason enough to arrest him, Freedheim said. Detective Patrick Michaud acknowledged that priority and limited resources play into which cases get attention, but denied that the police unit charged with serious hit-and-run investigations is understaffed. Now a public affairs representative for the Seattle Police, Michaud previously trained as a traffic investigator with the department. Calling the decision to wait a hard one, Michaud defended it as sometimes necessary when a case isn’t cracking and detectives need to focus on newer crimes. And both Michaud and Freedheim stressed that even cases older cases do sometimes get solved, when jilted lovers or old acquaintances decide they don’t want to keep a driver’s secret any longer. On behalf of the Emerald, Michaud requested statistics from the Police unit charged with investigating serious traffic accidents. In a follow-up, Michaud provided the total number of cases from the previous year – 115 – but said the unit would not reveal how many of the cases it solved that year without a formal records request. When he saw his daughter’s body fly through the air, said Moalim Edo, Zeytuna’s father, his first thought was that she had been killed, so violent was the impact. The Edos are from Ethiopia and speak Oromo, a language with many words borrowed from Arabic. As he talks, speaking with the help of a translator, Moalim says a word familiar familiar to an Arabic speaker. Talking fast about his daughter, he says it three times. He didn’t think she would live, but she did. Hamdullilah. She came home, and can walk now. Hamdullilah. She’s back in school, and it’s hard, but she’s getting better. Hamdullilah. For Trevon Crease-Holden, the chance of such a normal life anytime soon is more remote. Confined to a wheelchair, unable to move one arm and forced to use a feeding tube, life is a series of smaller steps for the young man. Trevon can speak now, although he’s in speech therapy. After suffering a traumatic brain injury when he was hit, he is having to re-learn how to use his palette to stop his breath, and air rushes out as he speaks, even when he doesn’t want it to. But his memory was unaffected by the crash, and he can still read and do math. This year he went to school for one day. Next year, Quianna hopes he’ll be able to do the whole year. But two years later, along with hope and resolve, the memory of the anger is also still there. At one point, early in the investigation, a detective told her that her son’s case would have been a higher priority if he had been killed. But Trevon lived, and the car that hit him was reported stolen shortly after the hit-and-run. The owner had refused to talk to officers when they asked about the accident, and the police said there was nothing more they could do. Although she has come to accept that her son’s life has been changed forever, Quianna said, what lingers is the feeling that her son’s case was put on the back burner. Outside, the cars fly along the streets, each on some private mission, the mission of a normal life. Most infuriating, said Quianna, is the fact that in one of them is the person who maimed her son. A little more than a mile from the place where Trevon was hit, on the same road, is the Edo family home, and a short walk beyond is the place where Zeytuna was hit. The road is divided there, two lanes on each side separated by train tracks and a concrete island. 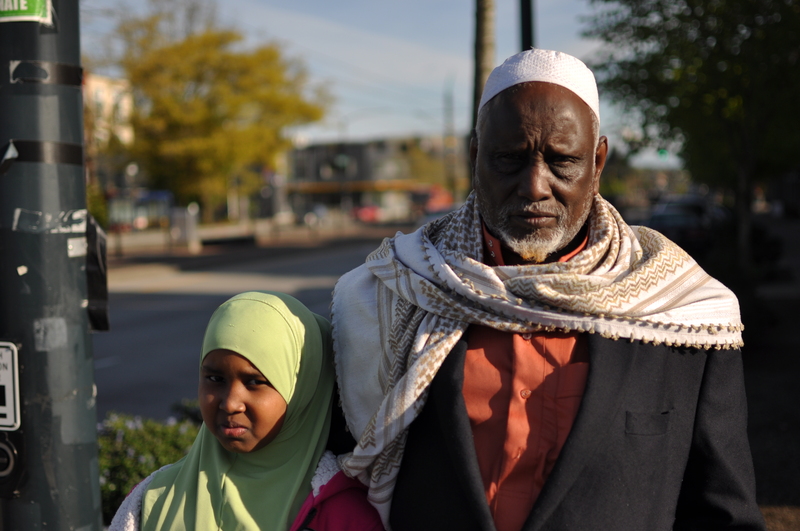 On the way to the Boys and Girls Club, Zeytuna crossed the road with her father and sister. The walk signal was on, and the three crossed half the road together, arriving at the protected median at the same time. Then, with the walk sign still on, she ran ahead into the road on the other side. She was still close enough to touch, her father recalls, when the red truck came along. At the same light seven months later, a woman waits with two children to cross the busy street. Like Zeytuna’s mother, she wears a flowing hijab, though hers is bright purple. The light turns, and the three set out. The younger child holds her hand, but the older skips in front, and reaches the median’s zig-zag bars a step ahead of her. The sun is setting, the boy is laughing, and he speeds up, bursting through the barrier like it is a finish line. Off of the concrete island, he throws his body in a joyous leap. This time, the cars stop. Incredible story. So heartbreaking. Thank you for writing and thanks to the families for opening up to you. What laws do we need to change this? To make disabling someone the equivalent of murder for the purposes of police investigations? Can a state initiative fix it? Thank you for researching and covering what’s been left in the dark.